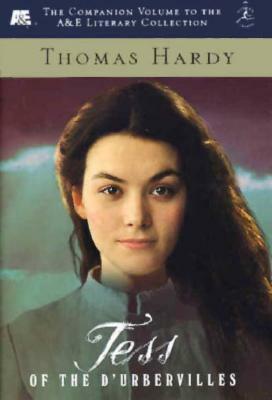 The latest in the Modern Library's series of tie-ins to A&E television presentations is Thomas Hardy's Tess of the d'Urbervilles. First published in 1891, the novel was attacked for its themes of suffering and the unavoidable progress of destiny. This, together with a similar reception for the later Jude the Obscure, convinced Hardy to give up writing novels to concentrate on poetry. Hardy's portrayal of Tess Durbeyfield, an abused, tragic heroine, was shocking for much of its nineteenth-century audience. As Irving Howe has commented, "In Tess he stakes everything on his sensuous apprehension of a young woman's life, a girl who is at once a simple milkmaid and an archetype of feminine strength". He continues, "Tess is that rare creature in literature: goodness made interesting". This A&E television presentation stars Justine Waddell, Oliver Milburn, and Jason Flemyng. It was filmed in Hardy Country, the beautiful English countryside in Dorset where Thomas Hardy set his novels. These tie-in editions are presented at a special price.